Each year at ISC West, the Security Industry Association (SIA) New Product Showcase program recognizes winners in several product and service categories. 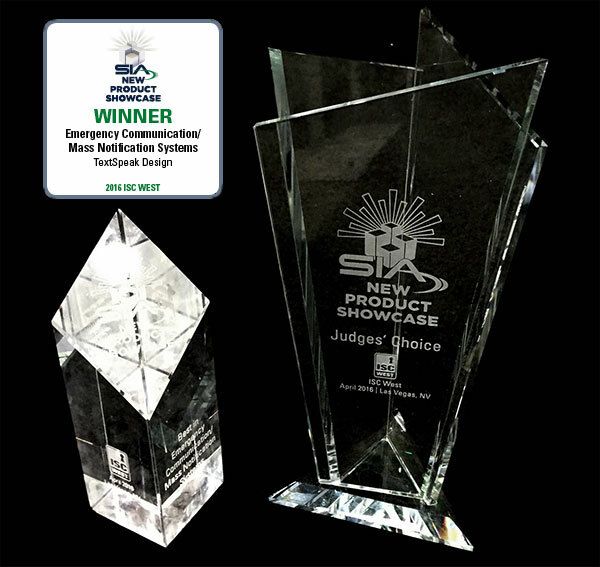 TextSpeak, for 2 consecutive years, has won in the Emergency Communication/Mass Notification Systems’ category, and also the prestigious ‘Judges Choice Award’, only awarded to a single product out of all the entries. The TextSpeak CE Device Amplifier is the industry’s first cellular enabled text to speech amplifier. 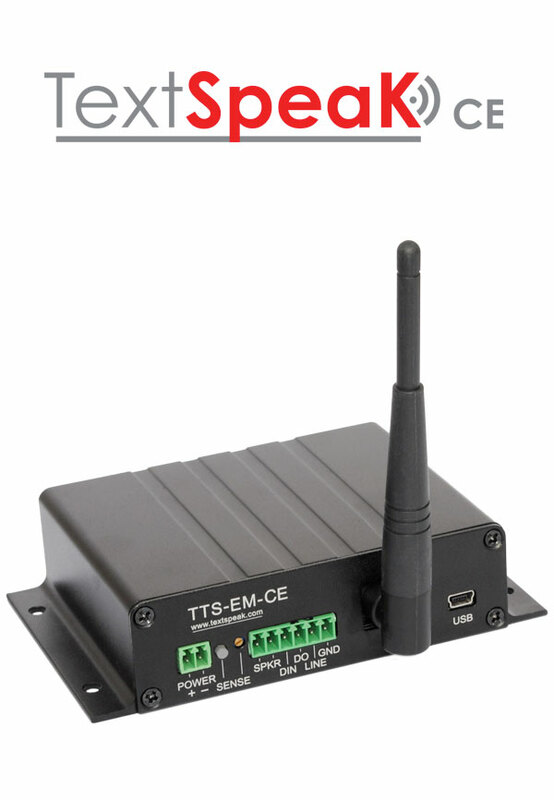 This new addition to the TextSpeak Device family transfers SMS emergency cellular text messages directly to endpoint speakers and paging systems. Simply send an SMS message to the pre-assigned telephone number and the amplifier speaks the text. The system supports 25 languages and instantly converts text and data to a high definition, natural sounding voice. The unit can feed line level audio into existing PA systems as well as directly connecting to local speakers via the 25 Watt amp output. The TextSpeak CE can be purchased as a standalone unit for integration into existing TextSpeak NOTIFY! Systems or new mass notification systems. It is also included in the TextSpeak NOTIFY! Cellular System as part of an out-of-box notification system that includes the TextSpeak App software. For the first time, wide-area mass notifications can reach beyond registered mobile phones. A single TextSpeak CE amplifier can announce a standard text message, sent from anywhere, directly to a paging system. The amplifier can also resend texted data to another network and/or display the announcement on an overhead LED message sign. User definable security levels ensure that only messages from authorized personnel, automated systems and/or emergency responders may generate announcements. As a first deployment, TextSpeak CE offers a simple, powerful, ready-to-go Mass Notification solution. As an enhancement to large existing systems, TextSpeak CE can be added as a new “cell phone” to a distribution list, and announce audio over any existing paging system. Benefits include deployment simplicity, effectiveness and access for institutions who are challenged to find affordable mass notification solutions. When Mass Notification products are compared, the TextSpeak advantage in comparison is clear. TextSpeak is the ONLY Mass Notification Alert system that offers Audio Announcements over cellular with e-Alerts, Text Messages, SMS, Voice and Emails in a ready-to-use package. 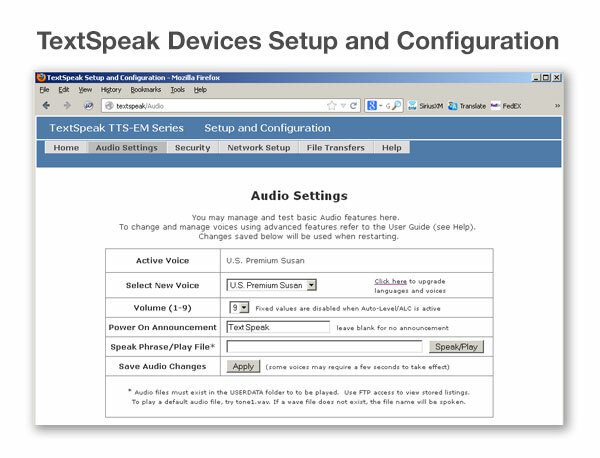 The TextSpeak CE offers a complete Text to Speech platform with a high definition 25 Watt audio paging amplifier. Integrated ambient noise detection optionally allows a 12-20 db SPL ALC (Automatic Level Control) meeting customer demands for clarity in environments with dynamic noise activity. Typical deployments include building, industrial, campuses and public space installations. Ethernet connectivity offers simple setup, management and control via SMS, FTP and TCP, RSS and XML packet data. Text to Speech generation includes support for word compare and dictionary comparison management, in-line control codes and dynamic language with voice switching. Simply connect your TextSpeak CE Amp via the USB port to your computer, connect a test loudspeaker and power up. The unit speaks it’s IP address so just enter the address into your browser to access the simple setup software for your amplifier. TextSpeak earBridge-CE can also add a VOICE to your EXISTING Mass Notification message and Mass Alerting emergency safety distribution system. Improve and expand Notify! using your AtHoc™, EverBridge™, Omnilert™ , Blackboard™, SendWordNow™, Mir3™, ReadyAlert™ and Rave™ systems. Just add the pre-configured moblie number to your registered distribution list for SMS and Text Emergency Notification and Alert Messages, and earBridge will ANNOUNCE the text message anywhere you need live audio announcements. For more information on interfacing with EverBridge™, AtHoc™, Omnilert™ , Blackboard™, Mir3™, ReadyAlert™, SendWordNow™ and Rave™ systems please contact our team. Learn more about TextSpeak Notify! as a complete mass notification alert and messaging system for Campus, Schools, Industry, K12, Factories and buildings to protect employees, students, visitors with instant text, email, voice call and audio announcements. Related TextSpeak Devices and TextSpeak NOTIFY! Textspeak is a Trademark of Textspeak Design Group. Rave, SendWordNow, Mir3, EverBridge, AtHoc, Omnilert and AlertUs are registered trademarks of their respective owners.